On 15 February 2008, Mark Beaumont pedalled through the Arc de Triomphe in Paris. 194 days and 17 hours previously, he had begun his attempt to circumnavigate the world in record time. Mark smashed the Guinness World Record by an astonishing 81 days. He had travelled more than 18,000 miles on his own through some of the harshest conditions one man and his bicycle can endure, camping wild at night and suffering from constant ailments. The Man Who Cycled the World is the story not just of that amazing achievement, but of the events that turned Mark Beaumont into the man he is today. From the early years of his free-spirited childhood in the Scottish countryside to present day, he has been equally determined not to settle for an average existence, but to break free and follow his dreams. 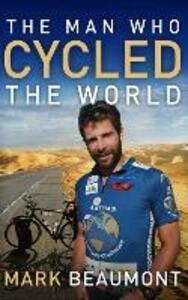 Mark Beaumont grew up in the foothills of the Scottish Highlands. When he was twelve, he cycled across Scotland, then a few years later, completed the 1,000 mile solo ride across Britain from John O'Groats to Land's End. His next long-distance ride took him the length of Italy, a journey of 1,336 miles, helping to raise £50,000 for charity. After graduating from Glasgow University, and having also qualified as a professional ski instructor, he decided against a conventional career and devoted himself full-time to raising money for his endurance adventures.